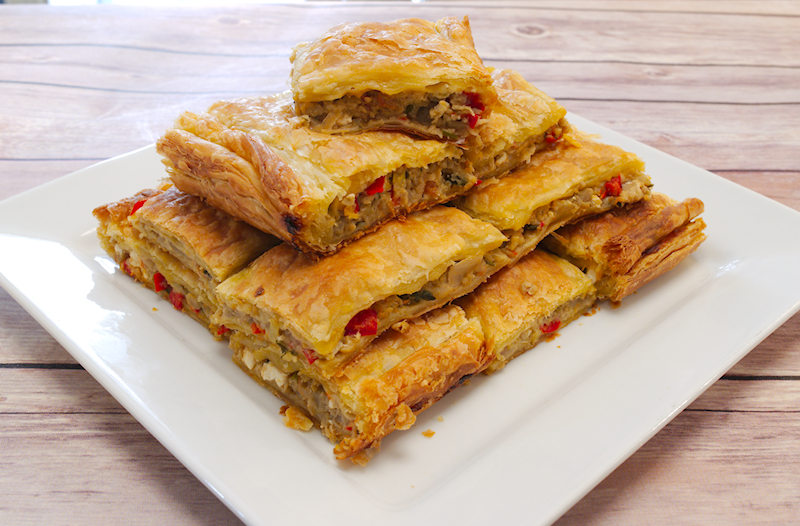 This is a fantastic recipe for Greek eggplant pie with peppers and feta cheese. It’s the very popular Melitzanopita. My queen is back again! No, I am not talking about Khaleesi or any other fancy queen. It’s the eggplant, the queen of vegetables. She may not have dragons but she definitely reigns the kingdom of farmed food. I love the eggplants cooked in any kind of way. In the oven, like the Imam Bayildi, in cupcakes, wrapping meatballs, in salad…you get the idea. There is a famous Greek dish that wanted to make for some time. Her majesty Melitzanopita. You know, the Greeks love their pies and they make an excellent eggplant pie with all the usual herbs and stuff. 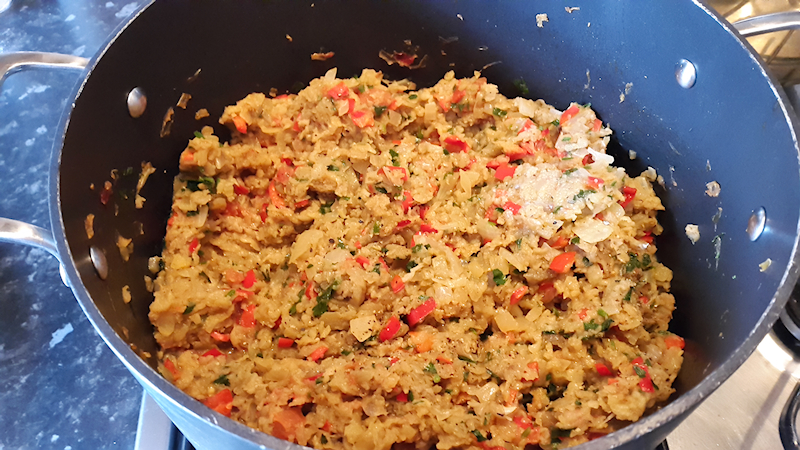 Having found 4-5 lovely eggplants, I went straight to the kitchen and started my magic. In every pie you make, the big difference is made by the selection of the filo pastry. The ladies in the villages in Greece they make their own filo and their pies are really something amazing. It takes them 5-10 minutes but I guess, for most of us, that seems like a lot of work. And it won’t take 10 minutes! I used some puff pastry I bought from the supermarket. It was good but I couldn’t help myself comparing it with my grandma’s homemade filo. Unfortunately, she is not with us anymore, but she would be proud of her grandson’s Melitzanopita. Even with pastry bought from the shop. 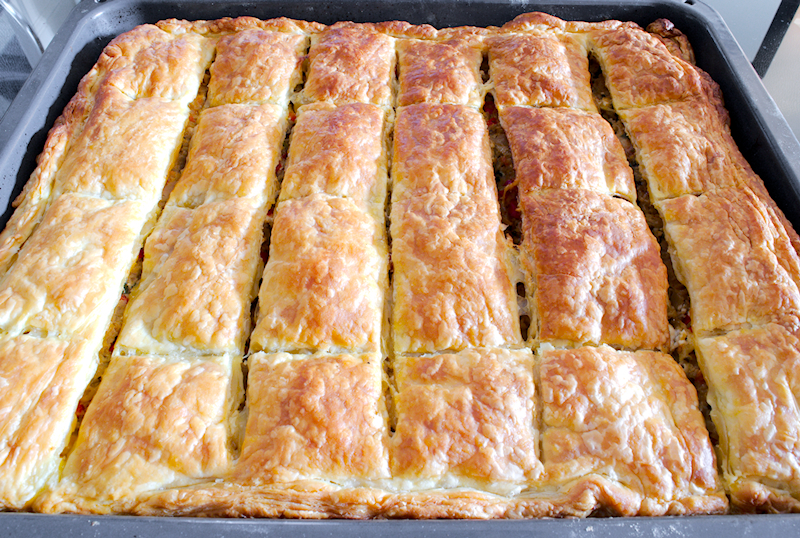 So, go ahead and treat yourselves with a lovely and tasty eggplant pie. The great thing is that it tastes even better as a leftover. 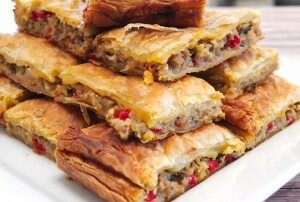 This is a fantastic recipe for Greek eggplant pie with peppers and feta cheese. It's the very popular Melitzanopita. 2 long peppers finely chopped. 1 red chili pepper finely chopped. 1 beef tomato peeled and diced. 200 gr (7 oz) Feta cheese crumbled. 100 gr (3.5 oz) yellow hard cheese grated. Peel the skin of the eggplants and use the coarse side of a grater to grate them. Place them in a colander, sprinkle some salt and the lemon juice and let them release their juices for ~ 30 minutes. 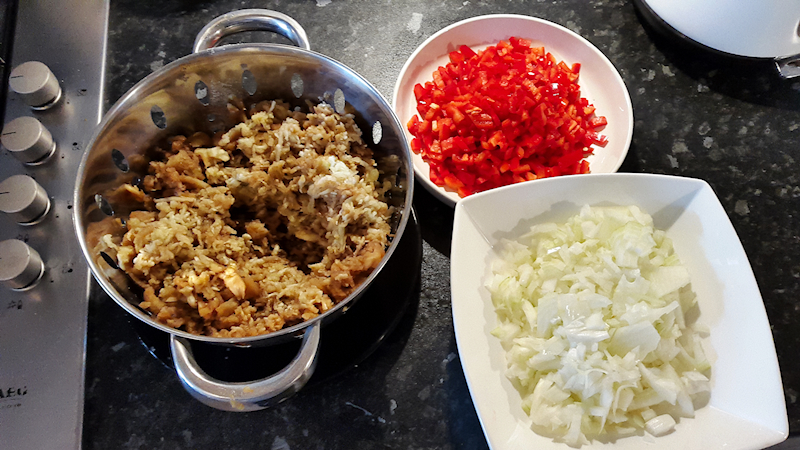 Add the onion, red pepper and chili in a pot together with ½ cup of hot water on medium heat. Bring it to boil and let it cook for 3-4 minutes until the onion and peppers become soft. Add 4-5 tablespoons of olive oil and the diced tomato and continue cooking for another 5 minutes or so. Add the grated eggplant, season with salt and pepper and stir well. Let it cook for 6-7 minutes while stirring occasionally. Add the parsley, stir well and cook for another 2 minutes. Remove the pot from the heat and let it cool down. You can put it in the fridge for ~ 30 minutes or leave it outside for an hour or so. It is important that the mixture is cold enough before the next step. Add the eggs, Feta and grated yellow cheese into the mixture and stir well. Preheat the oven at 220 degrees Celsius (430 F). Use a large and relatively shallow tray. Spread some olive oil on the bottom and the side walls of the tray using a kitchen brush. 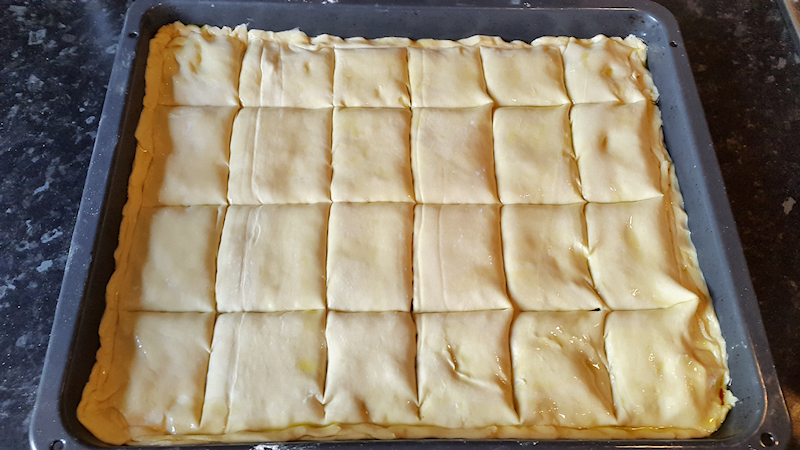 Cover the bottom (and part of the side walls) with a sheet of puff pastry. Add the mixture and use a spoon to spread it nicely. Make sure that the eggplant filling in the pie is not very thick, a bit less than an inch (~ 2 cm). 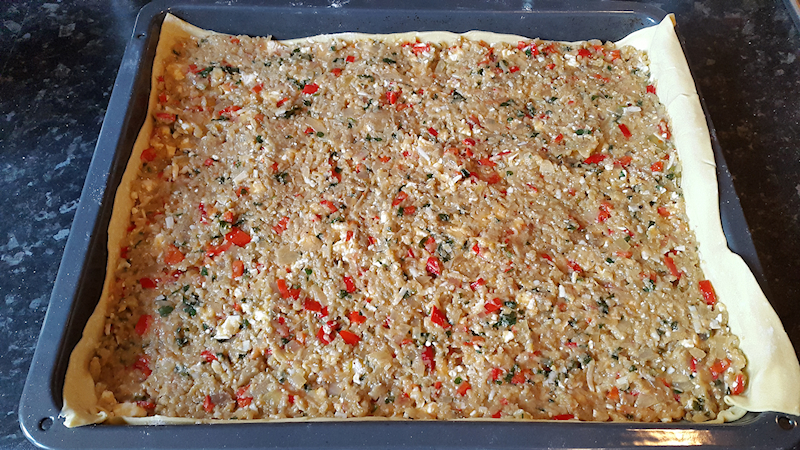 Cover the mixture with the second pastry sheet and fold it in the sides and corners. Spread some olive oil again on the top. Use a sharp knife and gently cut the pie into the pieces you are going to serve later. Make sure you don’t reach the bottom with the knife. Bake your pie for ~ 30 minutes until golden brown. Let it rest at room temperature for ~ 20 minutes to be able to cut it easily. Made this recipe for dinner and was a huge hit with my husband! Thank you for a great recipe. This recipe looks delicious! But I’m curious as to exactly what kind of pepper you are referring to when you say “long pepper” and what kind of cheese you used in reference to “hard yellow cheese”?